Most of the people don’t have the luxury to invest time and energy in decorating their house. All of us need simple, effective and time efficient ways to revamp our house. One of those ways is by using vases. A vase is open container which more often than not used to hold cut flowers. If you are a person who loves flowers then one thing is for sure that you will have too many vases to care. Even though vases are there to make our house look beautiful, if they are too many they can become irksome. Who says that vases need to be used only for keeping cut flowers? There are many ways to use a vase. 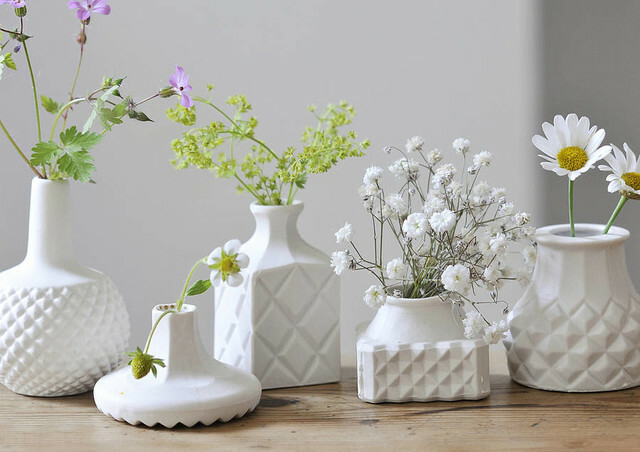 Depending on the shape and the size, vases can be used in different parts of the houses for different purposes. Vases can be used both indoors and outdoors. For outdoor uses they can be used for the very purpose of planting flower plants. You can also use them to grow bonsais. Vases can also be used to store water and keep cut flowers to beautify the very surroundings of your house. Glass vases are the classic ones. They have been in season for a really long time and are generally made for the conventional use of keeping flowers. Crystal vases are the most elegant ones. They have the most beautiful designs and can be used for aesthetic purpose. Clay vases have been in existence for a long time and come in a variety of designs making them one of the most versatile vases. Short vases are part of the contemporary design. Metal vases have more antique look and are expensive because they mostly involve intricate work and are less prone to breakage. If you don’t have space to keep the vases you can always donate them. You can donate them to local flower shops, nursing homes or retirement homes, hospital gift shops etc. Some of the bigger vases can be used as kitchen garden. You can keep it near your kitchen and take care of them while you cook. Apart from using them as kitchen garden you can also use them for decorative pieces in your garden and planting small shrubs in them. Crystal or glass vases can be used as fishbowl, giving a whole different twist to aquariums. They not only look beautiful but give a modern edge to your home. Metallic vases can be placed in your home for their aesthetic appeal alone. Some of the floor metallic ones can also be used as lamps. By adding a lamp shade and getting the fixture done for the bulb you have DIY lamp that you can show off. The most conventional use for vases apart from holding flowers is to hold utensils. You can design them however you wish and use them in the kitchen. Vases that have broad base can be used to hold small items like keys, loose chains etc. Vases not only just make our home beautiful they also unleash our creativity when we have to design them or place them as uniquely as we can in our homes.